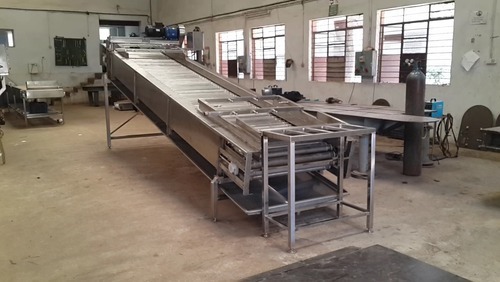 Offering you a complete choice of products which include mango washing line, mango blanching machine, roller conveyor and merry go round conveyor. By utilizing skills of our dexterous workforce, we are offering a comprehensive assortment of Mango Washing Line. Offered line is highly demanded in the market owing to its excellent quality raw material to ensure strength and robust construction. We manufacture this line by employing optimum quality raw material and sophisticated technology in adherence to the set industrial standards. Owing to features like high performance and easy installation, our offered line has been able to earn a lot of popularity in the market. Based on the skills of our adroit professionals and creative workers, we bring forth an extensive range of Mango Blancher. It is mainly used to remove insect eggs, pesticides and to remove completely microbial counts on the surface of the fruits to increase the self life of the product. Owing to features like durability and light in weight, the offered line is extensively demanded in the market. A team of our adept professionals, with hard-earned experience manufacture the offered line using high grade raw material. The offered line is available with us in various sizes, designs and other related specifications. Sujay industries manufacture and supply of complete line for mango Blanching machine mainly to remove insect eggs,pesticides and to remove completely microbial counts on the surface of the fruits to increase the self life of the product. Sujay industries offers complete turnkey solution for Mango processing line made out of SS304 food grade steel. As an esteemed name in the relevant industry, we are offering a precision-engineered array of Mango Cleaning ,Washing and Conveying Roller Conveyor. Mainly used in mango pulping industry for cleaning,washing and feeding mango to the washer.Following industry defined guidelines, we manufacture the entire range by utilizing contemporary machines, modernize technology and prime grade raw material. In order to ensure quality, the entire range is rigorously tested upon a series of parameters. In tune with clients' diverse requirements, we offer the entire range in a wide range of specifications at market leading rates. Owing to our state-of-art manufacturing unit and the usage of leading-edge technology, we are able to present a comprehensive range of Merry go round Conveyer. Keeping in mind current market development, mainly used for peeling,slicing of mango, papaya, melon fruits, this conveyor is manufactured by our qualified professionals employing premium quality raw material and modernize tools. Apart from this, our quality inspectors perform a series of quality test on the entire range of conveyor ensuring its flawlessness. 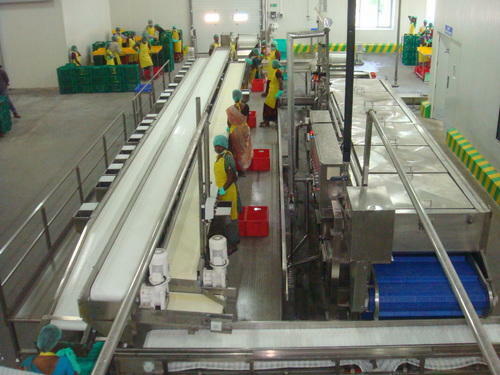 Looking for “Mango processing machinery”?